Young Farmers paid a fitting tribute to those who fought and died for their country in a powerful and impressive floral art competition. Hundreds of Young Farmers across England and Wales took part in the annual competition at the Malvern Autumn Show. Divided into three age groups, each contestant was given one hour to produce a display based on a theme of World War 1. The end product was a beautiful range of floral art displays that greatly impressed the judges and visitors to the show. 16 & Under competitors were asked to create a piece based on a war poem, while the 21 & Under contestants created displays based on the Last Post. Finally, the 26 & Under Young Farmers created their centrepieces based on the famous theme, 'Your Country Needs You'. With such a wide range of breathtaking and moving displays, the judges had their work cut out in picking out the top three displays. But after careful deliberation, it was Lucy Jeyes of Brandon & Wolston YFC in Warwickshire who came out on top in the 16 & Under category. Lucy (pictured top right) said: "I'm really happy and overwhelmed to have won. It's taken me a couple of weeks to prepare this. My sisters have been doing this competition for years and they have never come in the top three. This is my first time here so I might have to rub this in their face!" 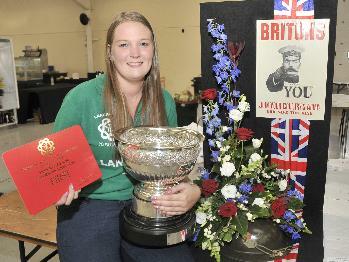 Meanwhile, Jessica Brookham of Launceston YFC in Cornwall took home first prize in the 21 & Under competition. Speaking about her display, Jessica (pictured centre right) said: "The red, white & blue represents the Union Jack, the cross represents those who lost their lives that we remember and of course the trumpet is what the Last Post was played on. "I wasn't expecting to win at all. I was really surprised given how strong the competition was. I don't think anyone from my club has won anything like this before, so I'm really proud!" Finally, Vicky Seed (pictured bottom right) proved to be the pride of Lancashire as she took the top prize in the 26 & Under category. 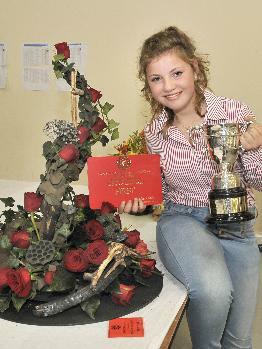 The Chipping YFC member said: "I'm very relieved to have won. It's taken me six years to get here, but I finally won, so I'm very delighted." "The hat belongs to a friend of my grandma's, that someone has leant me, to add to the piece." "I can't wait to tell people about it in Lancashire. The competition is very tough. You get to national level, you've done a good job, so to win is very pleasing." NFYFC would like to extend its congratulations to everyone who took part in the competition and contributed to an incredibly powerful range of displays. You can see all of the fantastic entries from this year's competition on the NFYFC Facebook page. A full list of results is available on the NFYFC website. Seasoning was the key to perfect dishes at the 2014 national cookery finals at the Malvern Autumn Show and the winning Pembrokeshire team got it spot on! Teams from across England and Wales battled it out on two small gas burners to prepare a meal that would welcome home a WW1 hero. 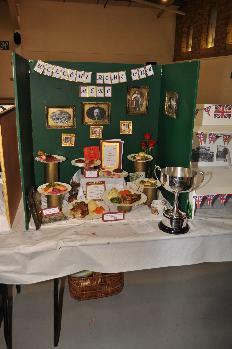 The dishes ranged from pork chops to steam puddings and all were presented in a range of beautiful display cases using war memorabilia and vintage crockery. Winners Eleri George, Sarah Jane-Thomas and Sarah Owen from Keyston YFC in Pembrokeshire said seasoning would be their biggest tip for future entrants. Some entrants even went a step further and wore old-fashioned aprons and hairnets while they were cooking. 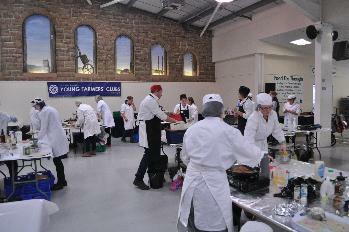 Crowds of spectators from the Malvern Show watched the chefs create their feasts and learnt more about YFC. Food expert and BBC Masterchef finalist Ben Axford judged the competition for the fourth year running and was joined by new judge Hetty Zeigler-Jones who runs her own catering and cake business. 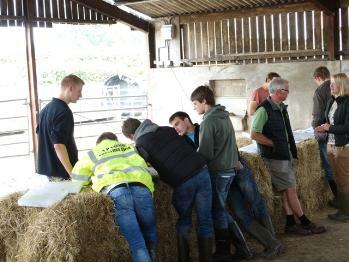 Both were impressed by the standard of the entries and Ben said Young Farmers had improved their technique. After all the dishes were prepared, the judges had the tough task of sampling and marking every entry. The judges were united in their decision to award Pembrokeshire the top marks, putting Radnor in second place and Co Durham and Lancashire A in joint third. Laura Powell, Nerys Hammond and Shaun Fairclough were awarded second place for their beetroot and orange soup with dill cream, fishcakes and a chicken dinner followed by a mixed berry trifle. “Credit to our cookery teacher who gave us lots of inspiration for today. We chose to use oranges in the soup as they would be just coming in and we thought it would be a luxury for someone coming home from the war,” said Laura. Lucy Armer and cousins Molly and Anna Dakin are all from Bolton and Bowland YFC and were delighted to be joint third in the competition. They created a trout pate with savoury pancakes, pheasant with red cabbage, apple and potato crisps, scotch eggs with quail eggs and steamed jam pudding. “We picked the dishes because we felt they fitted in well with the theme. We had two rehearsals together and then practised individual dishes on our own,” said Anna. Co Durham served black pudding and poached egg with crispy bacon to start, fish cakes, beef and Yorkshire pudding with leek mash and raspberry sponge pudding. “We took inspiration from our Great Grandad who has a farming background. We decided that you would keep your best produce possible and then cook it to a more sophisticated standard,” said Katie Sanderson from Elwick YFC. The county is climbing up the cooking ranks after placing fourth last year. It will be their last chance to compete next year and they’re hoping to reach the top spot! Congratulations to all the national finalists at the cookery competition. For all the photos from the competition, visit our Facebook page. 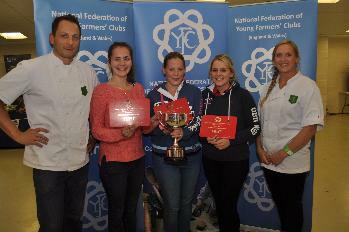 Results from the competition can be found on the NFYFC website. Have you got a favourite photo from Annual Convention that brings back some uber-brilliant memories of the major YFC event? Next year’s Annual Convention theme is focusing on the family, and NFYFC is searching for your fave photos from previous Conventions to create a super cool montage of memories. It’s not just about recent years either – the search is extending as far back as the first recorded event in 1968 in Harrogate! So get talking to parents, grandparents, aunts and uncles – basically any former and current Young Farmers who might have a stash of photos tucked away from their Convention days – and help us create a bit of YFC family history at Convention. The montage of photos will form part of the posters, website banners and feature on all the materials produced for Convention. NFYFC is also planning to show off all the piccies on a screen during Convention in Torquay. There will also be prizes on offer as well for some of the best mug shots – so get sorting through your snaps. Remember you’ve got to be in it to win it! 1. Choose your favourite photo from a previous Convention that includes you (and your friends if they agree). Keep them clean people! 2. If it’s a digital image, email your photo to magazine@nfyfc.org.uk at the original size (please don’t reduce the image size). Please include your name, Club (current or former), year the photo was taken, and contact telephone number. 3. If your photo is a hard copy image (we’re talking before digital guys) – then please scan the image to create a jpg or post the photo (with your name and address written on the reverse) and include a note in your envelope with your name, Club (current or former), year the photo was taken, and contact telephone number. Then post to: Convention Montage, YFC Centre, Communications team, 10th Street, Stoneleigh Park, Stoneleigh Park, Kenilworth, CV8 2LG. Please send your entries before Friday 17 October 2014 to be featured on the website banner. Other entries can be sent up until 9 January 2015 to be included in materials for Convention. Last minute trip to Denmark...? Due to a last minute cancellation, an opportunity has arisen for a member to attend the Autumn Seminar, 1st – 8th November 2014 in Denmark. NFYFC participates in RYE seminars, which are in various areas of Europe and usually last for a week. The seminars always have a theme and they are great fun, well planned and you get the chance to meet some great people from similar organisations. If you can only take a short time off from work or studies this may suit you. Flight, Insurance (depending on funding, participants will receive a travel reimbursement up to a maximum of 100%), Admin fee of £27.00, social expenditure. To raise awareness of the food situation from a global, European, national and local perspective with special focus on new tendencies within production as well as understanding the role of the consumer. Applications must reach the NFYFC office no later than FRIDAY 26th SEPTEMBER 2014. NFYFC will only accept applications signed by the applicant. 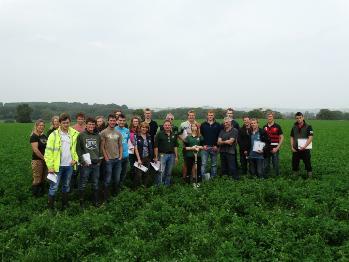 17 Young Farmers have gained vital knowledge of grassland management, thanks to the British Grassland Society. 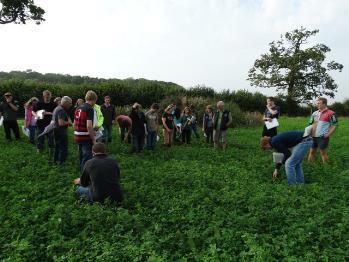 Eastfield Farm in Somerset played host to the Grassland Farmer of the Future Training Day. The event saw a range of experts speak about how to improve grassland management and increase profitability of farms. The delegates learnt about a wide range of topics, including planning a ley, grassland farming in the beef and sheep sector and grassland nutrient management. The training was held after a similarly successful event in 2013 and was worth 5 Dairy Pro CPD points to those taking part. 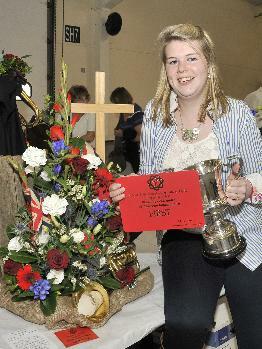 Charlotte Bolton, from Whimple & Broadclyst YFC, was one of those in attendance. She said: "The grassland training event organised by BGS and NFYFC has heightened the need for grassland management within the dairy, beef and sheep industries. "Showing how the correct implementation of seed variety and mixture, re-seeding programmes, the timing of nutrient application and the reduction of soil compaction aids the productivity of grass, resulting in improved yields in milk and meat production. The tour around the Seniors dairy farm highlighted how these methods are combined and implemented within a productive business to gain maximum profit from grass and forage." The free training was made possible thanks to generous funding from Defra. 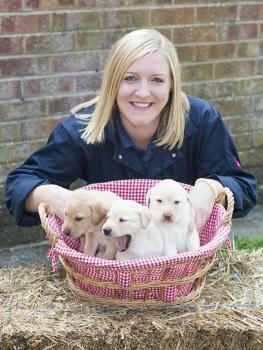 Milly Wastie, former chairman of NFYFC, has been nominated for an award at the Inspiration Awards for Women 2014. Milly, from Northamptonshire YFC, has been shortlisted in the 'Most Aspirational' category at the awards, due to take place on 2nd October at the Cadogan Hall in Chelsea. She has been nominated for her commitments to the charity sector and the advocacy work within agriculture. The awards ceremony is an uplifting and emotional event where stars and women from every walk of life are celebrated equally in one room. Along with promoting a positive image of women and acknowledging dynamic role models, the event raises money for Breakthrough Breast Cancer. Milly, who works as Regional Manager for the Royal Agricultural Benevolent Institution (RABI), said: "I’m planning on enjoying the experience and if I happen to win the award I would be absolutely over the moon! What I’m most proud about is that I have been shortlisted in such a mainstream awards ceremony and that they are recognising agriculture so I hope I can fly the flag!" You can read more about why Milly has been shortlisted for this highly impressive award by clicking here. The vote is open to the public, so to vote for Milly, please click here.